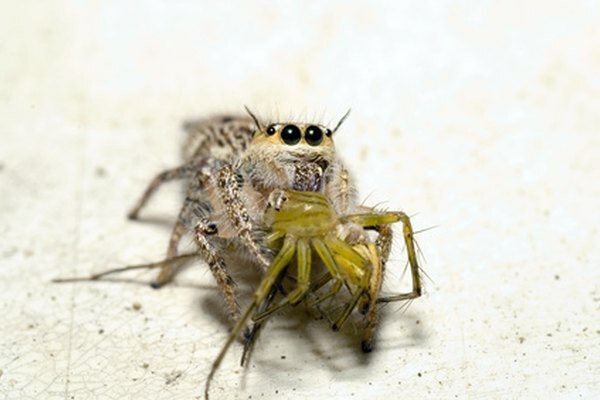 There are nearly 900 species of spiders in the state of Texas, according to Texas A & M University. Out of these numerous varieties only two species are seriously poisonous to humans, the recluse spiders and widow spiders. Numerous spider species can cause a painful poisonous bite, but most are similar to a bee sting. A few individuals can suffer from a serious allergic reaction to spider bites. The brown recluse (Loxosceles reclusa) is common throughout the southern and Midwestern states. 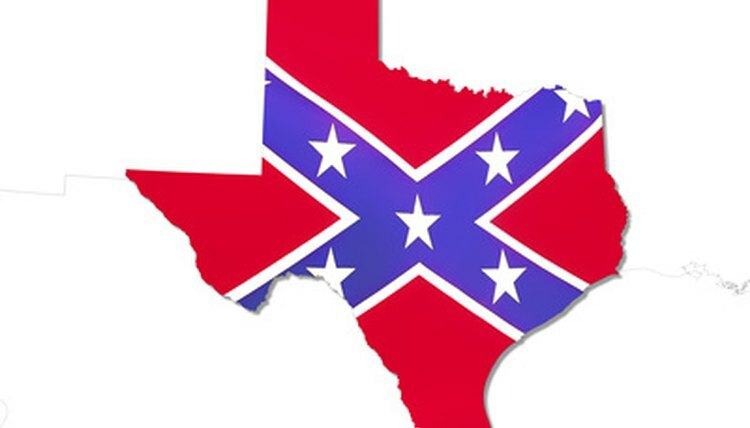 The spider thrives in Texas in numerous debris piles, under houses and within cellars. 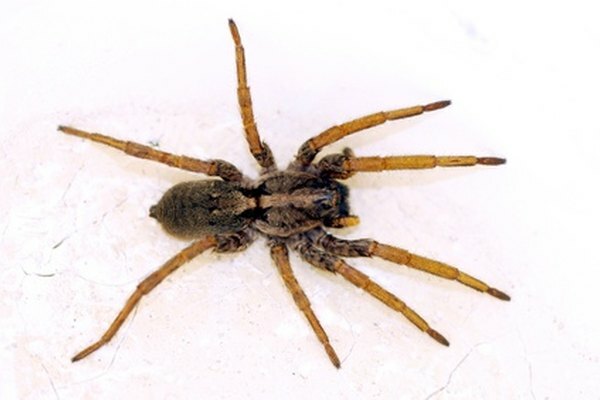 Brown recluse spiders are often found in dark areas inside homes like closets, attics, under sinks and furniture, and in small crevices. This spider tends to keep to itself and avoids human contact. They spin fine, grey webs that they hide within during the day. One of the distinguishing features of the brown recluse spider is its eye pattern: six eyes that sit in three pairs on the spider's back in the pattern of a violin, according to the Texas A & M University. Within 24 hours of being bitten, a victim will experience nausea, chills, fever and pain. The venom quickly kills the tissue surrounding the wound. Victims should seek medical care immediately. Southern black widow (Latrodectus mactans) spiders are found across the United States and throughout Texas. The state is also home to the western black widow (L. hesperus), the northern black widow (L. variolus), and the brown widow (L. geometricus). The widow spider is black with a red hourglass marking on its stomach.It lives in dark places such as under houses, in garages and cellars. Human victims suffer chills, fever, severe pain and tremors. Many who suffer from black widow bites will have difficulty breathing and quickly lose consciousness. Anyone bitten by a widow spider should immediately seek medical treatment. The tarantula (Aphonopelma) lives under rocks and other shaded locations during the heat of the Texas day and hunts at night. 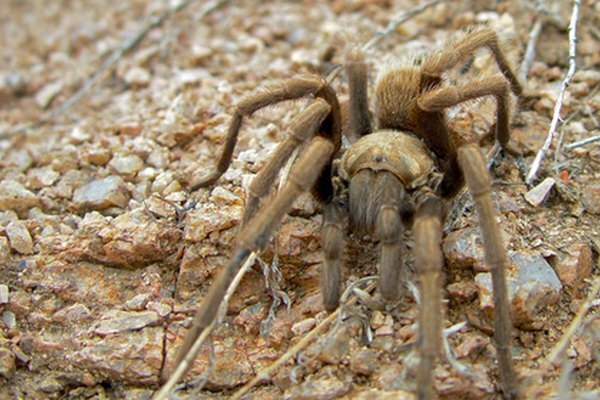 Numerous species of tarantulas live in the state. These spiders have exceptionally long fangs that they use to pierce human skin. The bite will cause localized pain, but if the victim suffers an allergic reaction the bite can be more serious. The hair of the tarantula can also cause skin irritation in certain susceptible individuals. The jumping spider (Salticidae) can be found throughout Texas. Each one of the many species can bite, but the poisonous reaction is mild and localized. The spiders very rarely bite except when cornered or scared. They enjoy living in gardens where they hunt by jumping on their prey by suspending their bodies from silken webs. Many are furry in appearance with striking color characteristics. Unlike many spider species the jumping spider is active during the day.